Established in 1961 in Matamata, a hub for the New Zealand racing industry, we extend our service to Tauranga and the greater region of the North Island. Our purposely constructed equine hospital offers an exceptional medical facility for all racing, performance, equestrian and leisure horses. Our team has a history of ground breaking methods and award winning veterinarians with international education and experience, with specialist abilities across a large number of fields within the equine industry to care for the needs and comfort of your horses, 24 hours 7 days a week, 365 days of the year. Our hospital is fully equipped featuring safe post and rail paddocks and yards, comfortable stables, complete with laboratory, surgery and medicine facilities all for the health and rehabilitation of each and every patient under our care. Our highly skilled team of efficient administrators, account services and managers can attend to any inquiry you may have and we also have a shop which is also online, offering a large number of quality equine products for horse owners. As a whole our practice speaks for itself with over 50 years of business experience, along with the dedication, professionalism and most of all passion devoted by the directors and there team, creating an outstanding establishment devoted to their current and future clients of the New Zealand equine industry. In Matamata New Zealand 1961, Colin Thompson started the practice that is today Marks+Ewen & Associates. Jim Marks joined Colin in 1965 and went into partnership the following year thus becoming ‘Thompson & Marks’. David Christopher then joined them in partnership in 1978 but sadly passed away in an accident during 1985. Bill Ewen started with the practice in 1979 as a graduate with distinction from Massey University, gaining three awards including the National Dairy Prize in Veterinary Surgery his career looked promising and he eventually joined Colin and Jim as a partner in 1986. Colin, Jim and Bill continued to build the practice that already had a sound dairy clientele and the support of the racing industry. Amongst their achievements they were involved in ground breaking procedures', Colin was the first veterinarian in New Zealand to use inhalation anesthesia on horses, Jim was the first vet to perform ‘Tie Back’ surgeries (wind operation) for ‘roarers’, and one of the first vets in New Zealand to use ECG’s in horses with poor performance. After an exceptional career as a vet and businessman Colin retired from the practice on 31st March 1997. When Dan Shaw and Rob Moorhead joined the partnership, the practice became ‘Vet Associates Matamata’. In 2000 Jim and Bill re-established the practice as Marks Ewen & Associates. As the local equine industry had grown it was decided to sell the dairy practice to Arjen & Alkie de Wilde who were both employed by the practice at the time, which has now become Landmark Vets in Matamata. It was then that the business was reborn and re-branded as ‘Marks Ewen & Associates Equine Veterinary Hospital’ with a new sole focus of specialising in Equine. Now with a new industry specific direction the practice has established its place in what is known as the racing hub of New Zealand. Over the past decade the clinic has been through growth and changes; sadly Rob Moorhead was involved in an accident on a stud seeing him fighting for his life. Although Rob recovered, shortly after he retired from active veterinary practice he sadly passed away. Dan Shaw has pursued a veterinarian career in Singapore and since sold his share in Marks+Ewen & Associates. As the decade ticked over a new chapter started, we saw the great career of Jim Marks come to a close, as he retired handing the reins over to his long term partner and friend Bill as the sole director. Bill, together with a highly skilled and equipped team, Marks+Ewen & Associates strive for excellence at all times; with the success of their loyal clients and a strong passion for the industry, the hospital continues to grow and develop with this bright future. 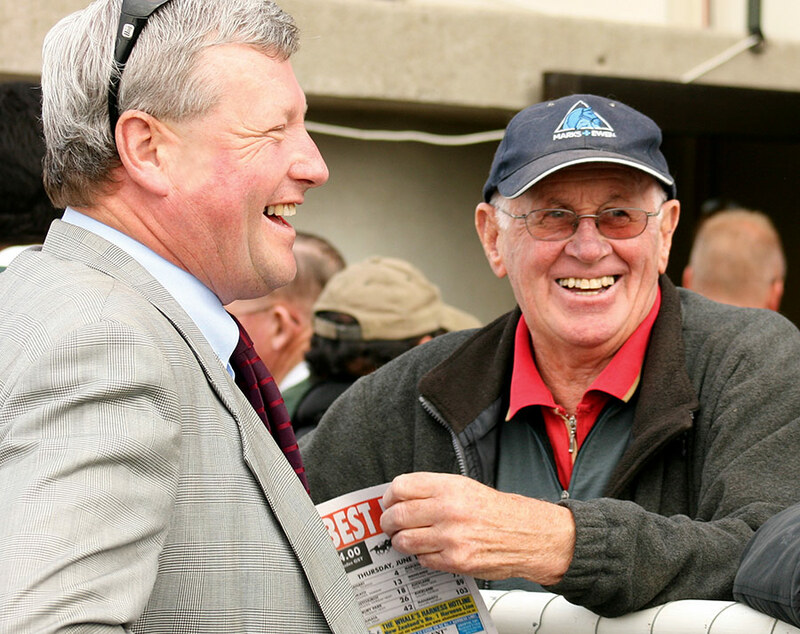 Bill Ewen and Jim Marks at the Matamata races.